Most herb grinders feel as though they're made as novelties, not kitchen-grade utensils. The caps get gummed up with resin, the blades quickly dull, it's a mess. 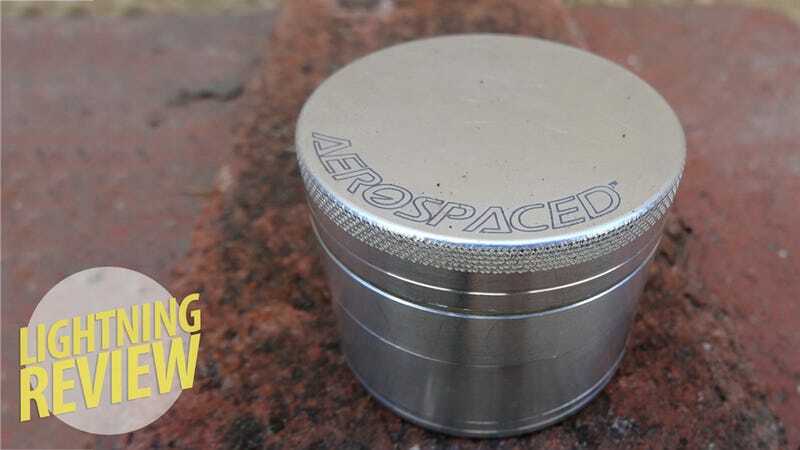 But where most other grinders fail, the Aerospaced 4-Piece excels. A stainless steel 50mm single-stage herb grinder with an integrated screen and keef catcher. Smokers, tokers, blunt wrappers, and tea makers. Made from anodized aerospace-grade aluminum, the Aerospaced 4-piece is CNC milled from a solid block. The upper cover/grind plate magnetically affixes to the lower grind plate where their ludicrously sharp teeth shred even the densest nugs. The processed plant matter falls through to a screened collections area that unscrews from the lower plate. The screen side of the collection section is capped with a screw-on keef catcher that conveniently stores a keef scraper as well. This is one of the finest grinders I've ever used, well-built and designed for efficiency. The magnetic upper cap makes the initial twists much easier than with screw-top models. Instead of having to line up the threads while trying to press the teeth through nugs, you simply shove this cap down until it's flush and start turning. Despite the aluminum casing having very few grip patterns, it's surprisingly easy to open. Like, SMOcan that I reviewed previously—a solid grinder/stashbox in its own right—would constantly bind due to the torque needed to twist the grinder. With the Aerospaced's super sharp blades and unibody design, no matter how hard I twist the upper stages, the collection section is always easily accessible. The shred is just fantastic. Super fine—even the occassional stem is no match—and perfect for rolling. Getting the shredded herb out of the collection section generally involves upturning the grinder and dumping everything out onto the table. This isn't an issue when rolling but makes removing small amounts of herb a chore and the screen bottom precludes using it with a one-hitter lest you accdentally punch through the screen while packing it. The little black triangle in the keef catcher is a very handy scraper, especially when trying to extricate the last bits of keef from corners. 16 teeth on upper cap, 12 on lower—super-duper sharp, reportedly "never dull"
It's a grinder that works equally well in your smoking room as it does in your kitchen and performs its duties with fantastic effectiveness. What's not to love? Special thanks to Vape World—the premier destination for quality vaporization products, service and advice.